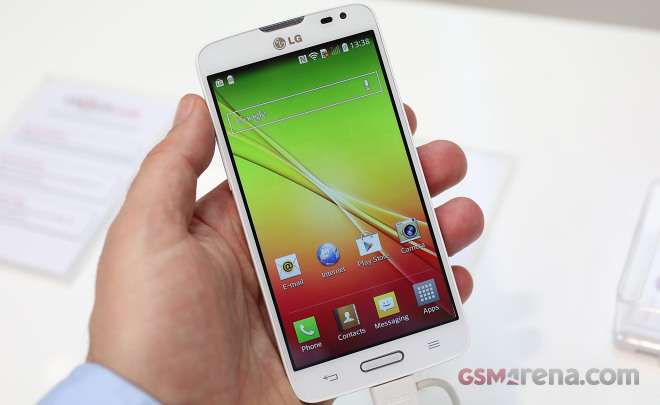 LG L70 is actually the third generation LG Optimus L7. It seems LG has decided on shortening the LIII series, which is actually a good thing. The L70 looks a lot like the LTE-enabled F70, it is even built around the same 4.5″ IPS WVGA display. LG L70 rely on a different platform though. Instead of a quad-core Snapdragon 400 as it was with the F70, the L70 relies on the Snapdragon 200 with a dual-core 1.2GHz Cortex-A7 processor, Adreno 302 GPU and 1GB of RAM. LG will be offering different versions of the L70. Depending on the market your L70 will either come with a 5MP on the back or with an 8MP snapper. There will also be a Dual SIM option, too. The phone is made entirely of plastic, but it has a rough-textured battery cover that is not prone to fingerprints or smudges. LG L70 offers great grip and is a pleasure to handle. Finally, the L70 runs on Android 4.4 KitKat, which thanks to the latest Google optimizations, seems really snappy even on the not-so-hot Snapdragon 200. LG L70 is supposed to launch next month, but the pricing is yet to be detailed. You can check our full scoop on LG right here.